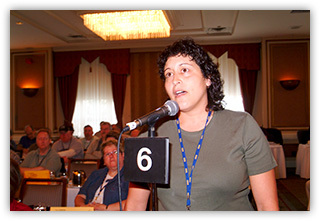 One of the ways to get the whole union to consider your idea is to submit a resolution to Convention. For example, discussions happened, around our union, in many locals, about the lack of respect in the workplace. The information about respect, the ideas about ensuring a workplace with dignity, the demand was heard in many places, became a resolution which went to Convention, and an idea passed. It passed and, with the leadership of the Union Executive and implementation by staff and members, it was acted upon. The member discussions, debates and demands for respect became the Bully-Free Workplace Education Program. The idea for this program started in locals, was discussed at locals and at Convention, and became a resolution. Now it’s a welcomed program, praised in the press, requested by members & employers, inquired about by other unions, and copied in other provinces. It was done with democracy, by members, with discussions and debates, and went to Convention. We (you and me) have affected the conditions of our work, the right to dignity, and we changed the world, made it a little bit better for us all, and for some, quite a lot. 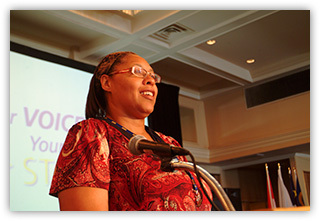 What good idea do you have that should be discussed at this year’s Convention? So if I have a solution to a problem or a better idea, how do I get it to Convention to be discussed? As an NSGEU member you belong to a local. Locals are the foundation of The Union and play an important part in the democratic processes of The Union. Some issues are bigger, or affect many workers. Sometimes this includes every member, right across the Province, or even all Nova Scotian’s, whether or not they are NSGEU members. The Convention is the supreme decision making (governing) body of The Union. 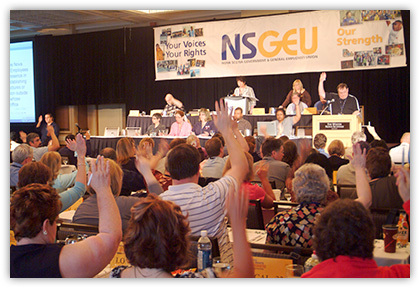 So every three years the NSGEU has a Convention and we have discussions and debates, and make decisions that set direction for the future. We discuss issues like protecting public services; adopt campaigns; fight back against cuts to public services delivered by our members; and promote social justice and equality issues like promoting gay rights, or fighting racism in our work places and our communities. Previous Conventions have changed the structure of the union, initiated campaigns, or training, or proposed donations to charities, or support for organizations who share our goals. If you have an idea that you want to share, you can use our democratic union processes to have it considered by delegates at Convention. And, even if you are not able to attend Convention, as a delegate, there is a way to have your views and your ideas debated. Submit a resolution to be considered by the Convention delegates. At Convention, your ideas are called resolutions. Any member can have their idea discussed and considered by taking their idea to their Local. There, someone may have an idea to add to yours, or an improvement, and there you can get help to write and submit it as a resolution. The Convention is always held every three years. What are some examples of Resolutions that changed the Constitution and By-Laws? How can I get help to write My Resolution? Where do I take My Resolutions and what is the Local’s responsibility? What is the role of the Resolutions Committee? What is the role of the Constitution and By-Laws Committee?